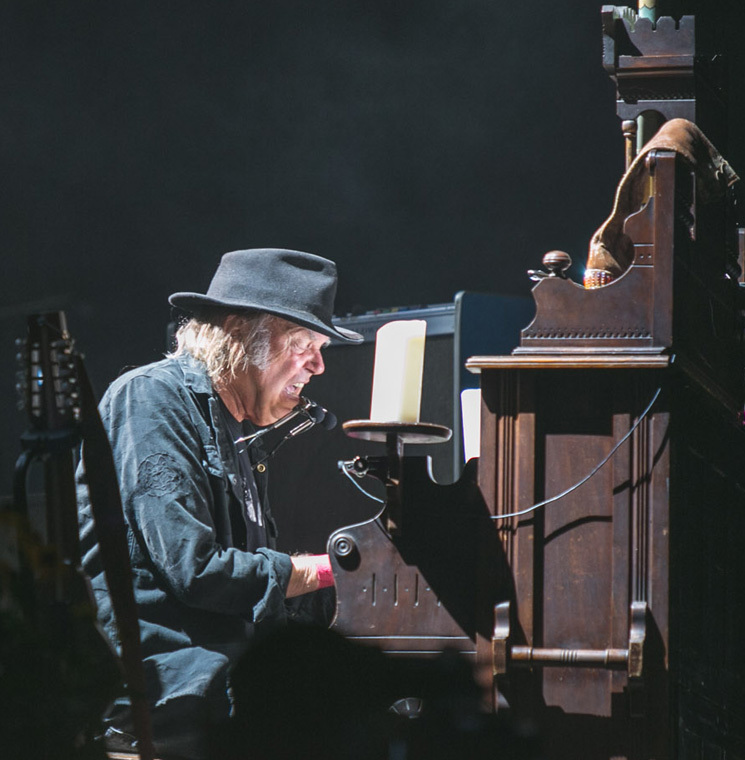 After a pair of farm girls sowed the stage with seeds, Neil Young appeared with little fanfare, a dark hat perking out from behind a piano at the side of the stage while he worked through "After the Goldrush." Clad in jeans, a black jacket and T-shirt with "earth" written across the chest, he continued his mini solo set, effortlessly knocking out classics like "Heart of Gold" and "Helpless" before he was joined onstage by his current five-piece backing band, Promise of the Real, which includes Willie Nelson's sons Lukas and Micah. Any accusations of nepotism were quickly brushed aside when it became clear that Promise of the Real were able to work both sides of Young's musical personality. Outside of his work with Crosby, Stills and Nash, vocal harmonies are often lost in the Neil Young legend, buried under squalls of Crazy Horse's feedback but Promise of the Real made a case for an immediate reassessment. The golden vocals for material like "Out on the Weekend" and "Unknown Legend" were expertly recreated, while Lukas and Micah proved they could more than hold their own musically, trading lick for lick with Young on long workouts of "Down by the River" and "Cowgirl in the Sand." The half-a-dozen selections from Young's recent studio collaboration with the band, The Monsanto Years, offered an abrupt shift in tone from Young's otherwise hits-laden set. It wasn't just that the songs were unfamiliar; their political sloganeering was so on the nose it was laughable. Yet once again Promise of the Real proved invaluable, deftly elevating Young's earnest-to-a-fault words through the power of their musicianship. For his part, Young, a notorious curmudgeon, could be seen smiling through most of his three-hour set. Whether this collaboration continues will be determined by Young's artistic whims, but on this night it was clear that there is chemistry between the two parties that brings out the best in both.